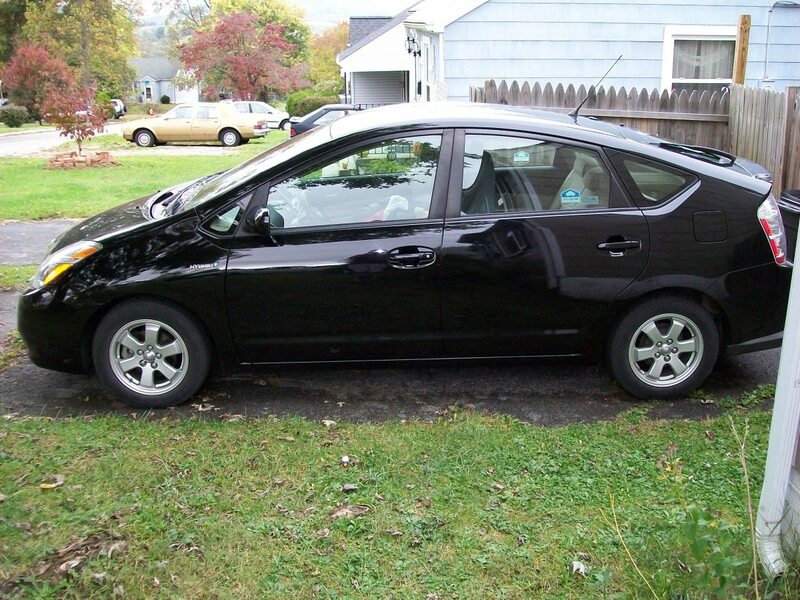 Alan is an avid DIYer who loves to tinker with his Toyota Corolla. The engine bay of a 1994 Toyota Corolla. 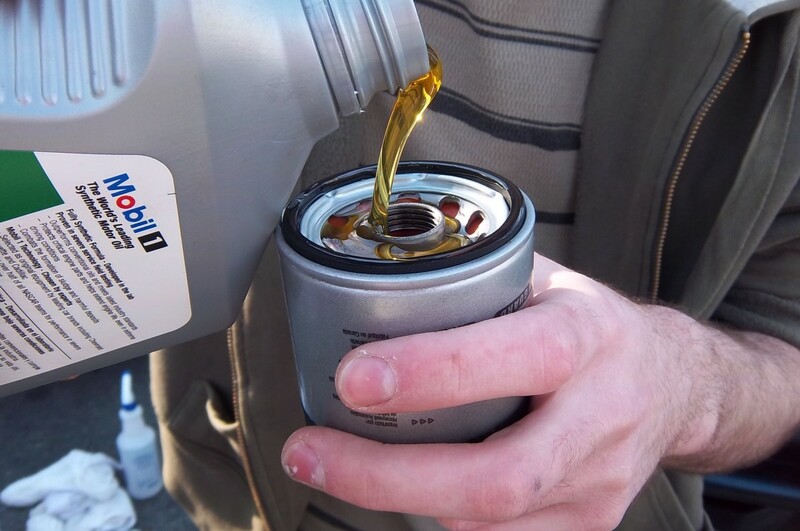 Regular oil changes are vital to ensuring your car's life and continued smooth performance. 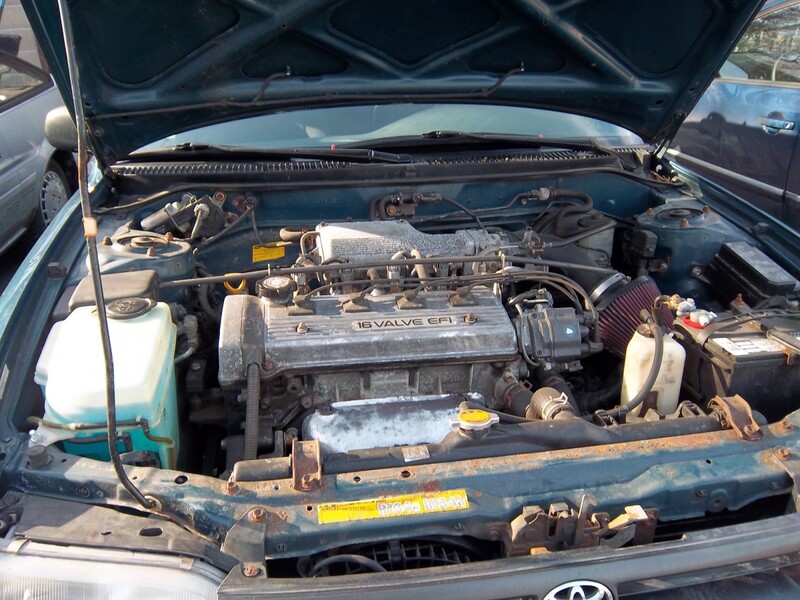 I am going to show you—step-by-step with pictures—how to change the engine oil in a 1994 Toyota Corolla with a 1.8-liter engine. The procedure is the same for a 1.6-liter engine—there's only a half-quart of difference (3.5 quarts vs 4 quarts). This applies to models between 1993 and 1997. 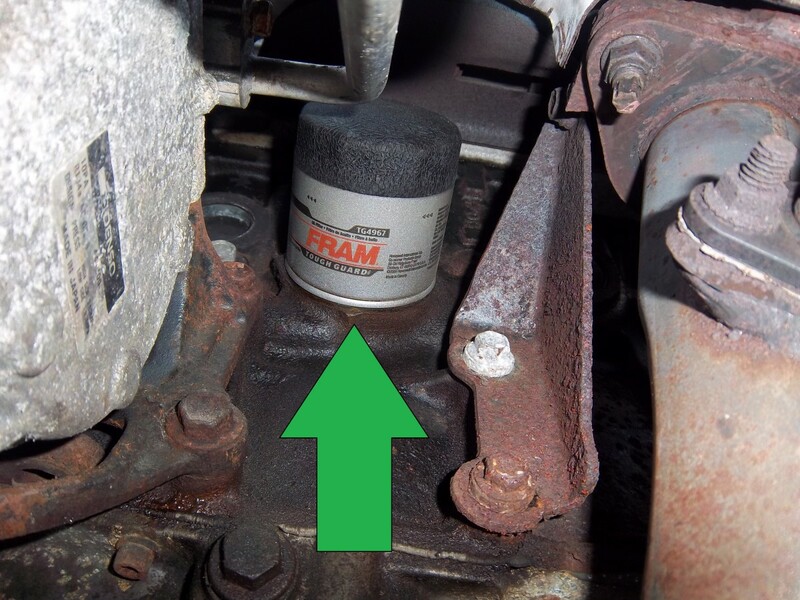 I am using Mobil 1 5W30 motor oil and a Fram ToughGuard oil filter—the good stuff. Access the drain plug and oil filter. For easier access to the underside of the car, I used automotive ramps to lift the front end up. You could also use jack stands, or just lay down in front of the car and stick your arm under. You can lay on a piece of cardboard or carpet so you aren't on the pavement. If you choose to raise the car with a jack, make sure that you support the vehicle with jack stands. NEVER get under a car that is supported only by a jack. Lift the car up, position the stands under the car's frame, and lower the car onto it. 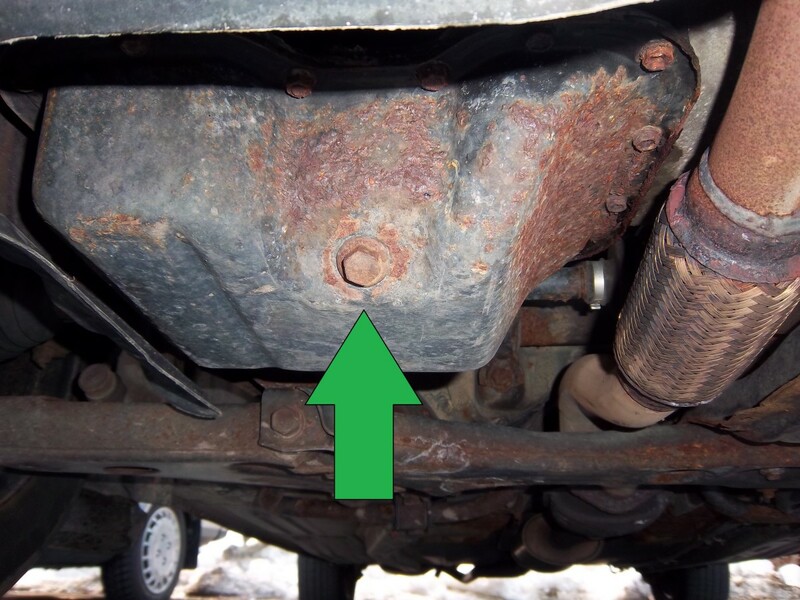 When lifting the car, place the jack against the pinch weld below the door and behind the front wheel. 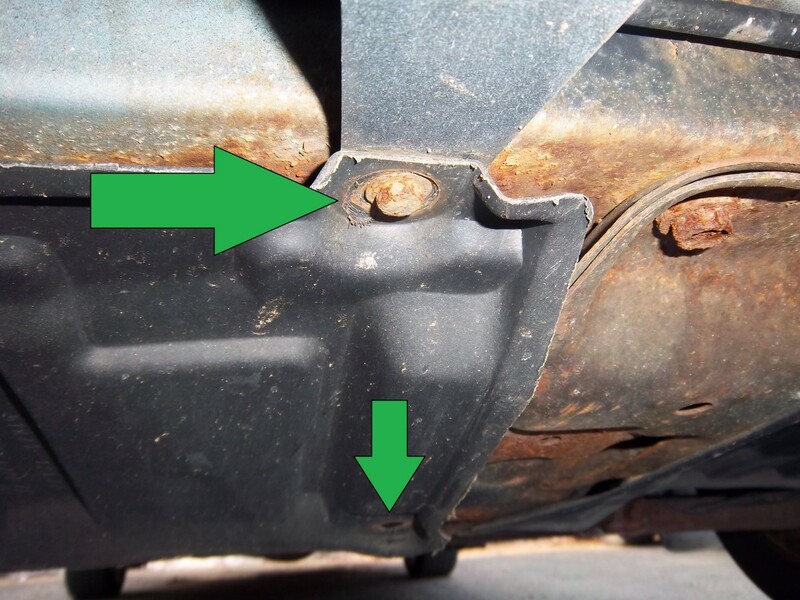 Don't lift or support the car by the floor pan or the rocker panel. Always apply the parking brake when the front wheels are off the ground. You should also wedge something behind the rear wheels—like a brick or block of wood—as an extra safety precaution. The owner's manual will have important information such as specific locations where you should place the jack when lifting the car and exact fluid types and capacities. All necessary tools and supplies for this job are readily available at any parts store like Auto Zone, or CAP—even at Walmart. Be careful not to burn yourself on the hot engine. Purple arrow: dipstick; Green arrow: oil cap; Blue arrow: hood latch. You'll want to have the oil fairly warm because it will drain faster and suspend contaminants better. It's a good idea to let the car run for 10-15 minutes while you are getting your tools and supplies ready. You don't want it to be too hot, though—you might get burned. 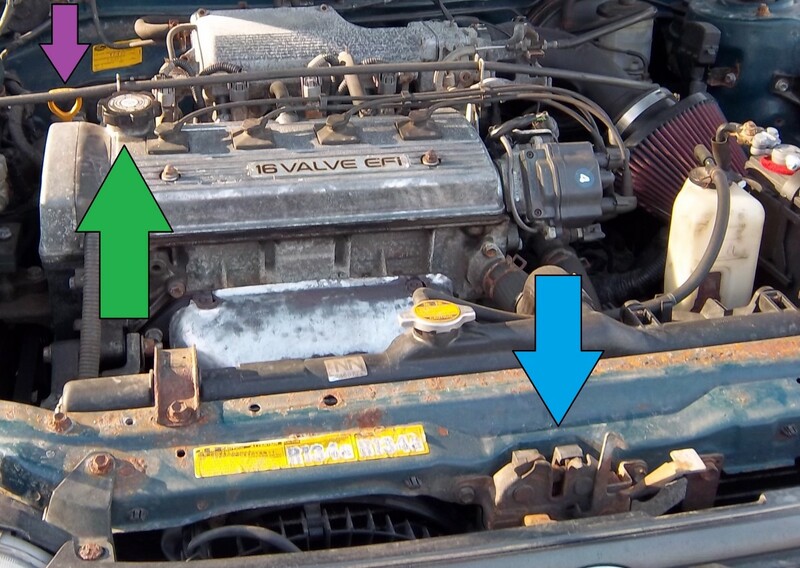 Once the engine is OFF, and you have the hood opened, the first thing I suggest you do is to remove the oil cap (green) and place it on top of the hood latch (blue). This will help make sure that you don't forget to put the cap back on once you've put the oil in! Everyone makes mistakes, haha. 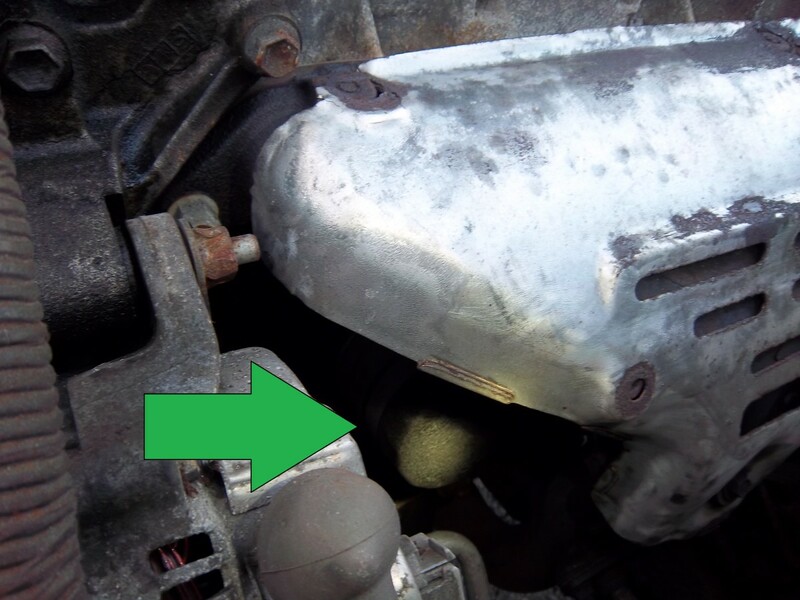 The purple arrow is pointing to the engine oil dipstick, who is trying to hide. The plastic cover hiding the drain plug and oil filter is held in place by 10-mm bolts. Be careful removing them as they are likely rusty and may strip or break. There is a plastic shield under the car that you will have to get out of the way in order to reach the filter and drain plug. There are several 10mm bolts holding it in place. You can remove some of them and then just pull it out of the way or remove them all. If they are rusty, they tend to break, so I leave them alone whenever possible. Put the bolts carefully aside so you don't lose them. If they break during removal, you can replace the bolts, or you can fasten the cover in place with string, tape, or whatever you have on hand. 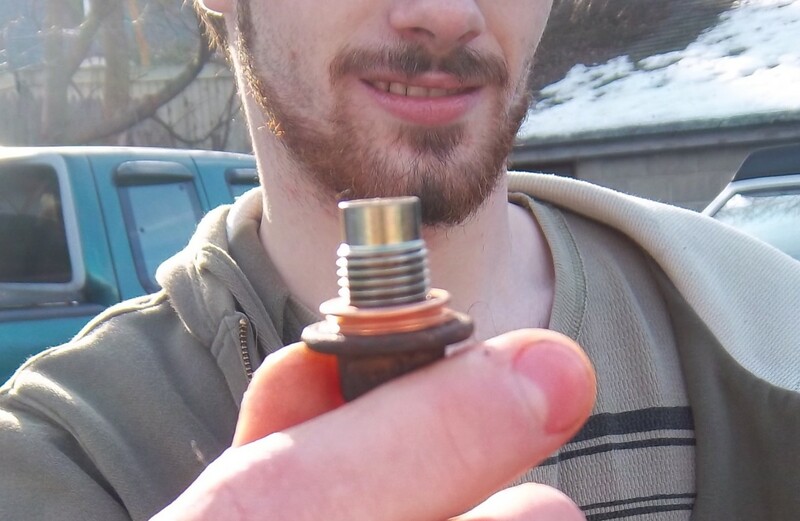 The drain plug faces the front of the car and requires a 14mm wrench or socket to remove. Make sure you position the drain bucket beneath and slightly in front of the drain plug so stream won't miss the bucket. Break the drain plug loose with a 14mm wrench or socket. Once it's loose enough, you'll want to carefully remove it by hand. The oil can come out rather aggressively, so try to hold your hand to the side of the plug and quickly pull away once the oil starts coming out. That way you'll get less on your hand. Keep an eye on the draining oil, as you will need to re-position the bucket as the stream loses pressure. NOTE: If you are doing this outside, the wind can blow the thin oil stream all over the place. 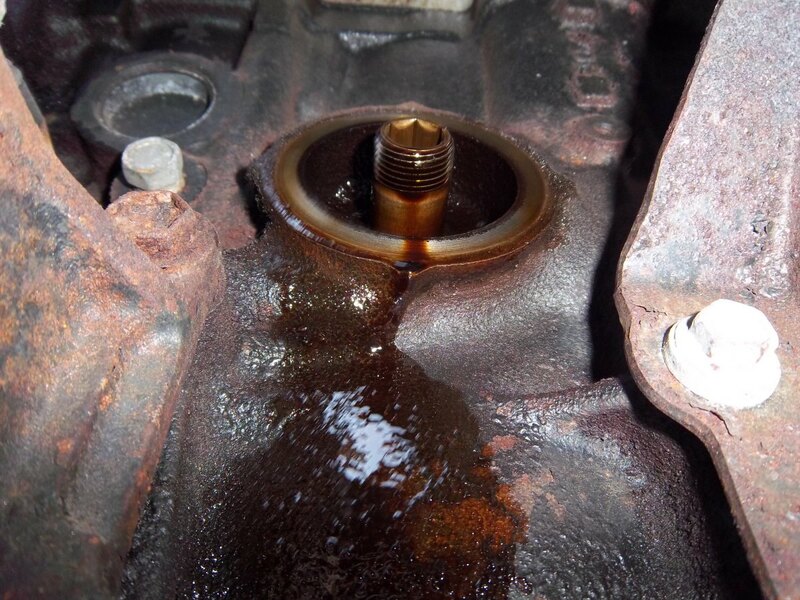 If this happens, you can put the drain plug back in loosely and let the oil build up behind it. Just make sure to take it out again and finish draining the oil after you replace the oil filter. 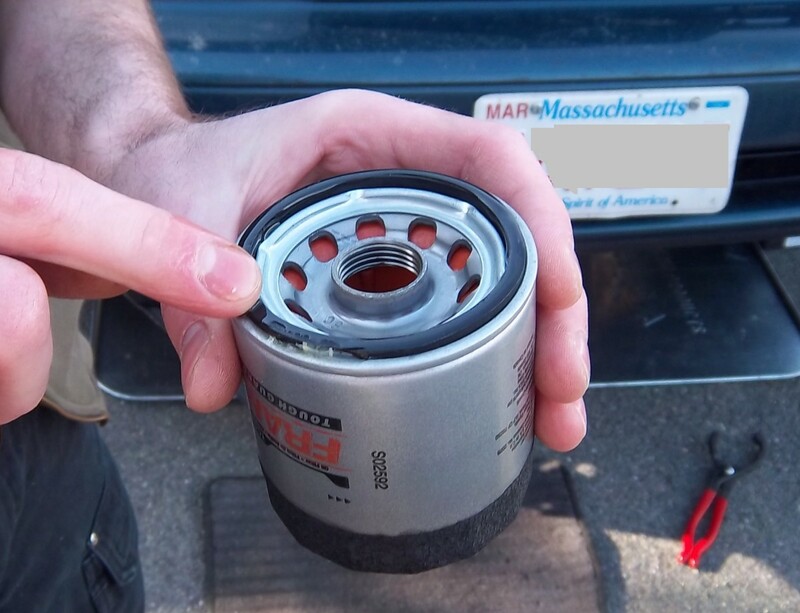 DO NOT attempt to access the oil filter from above when the engine is hot unless you have the proper tools to do so. You can get badly burned by touching the exhaust before it has cooled down sufficiently. 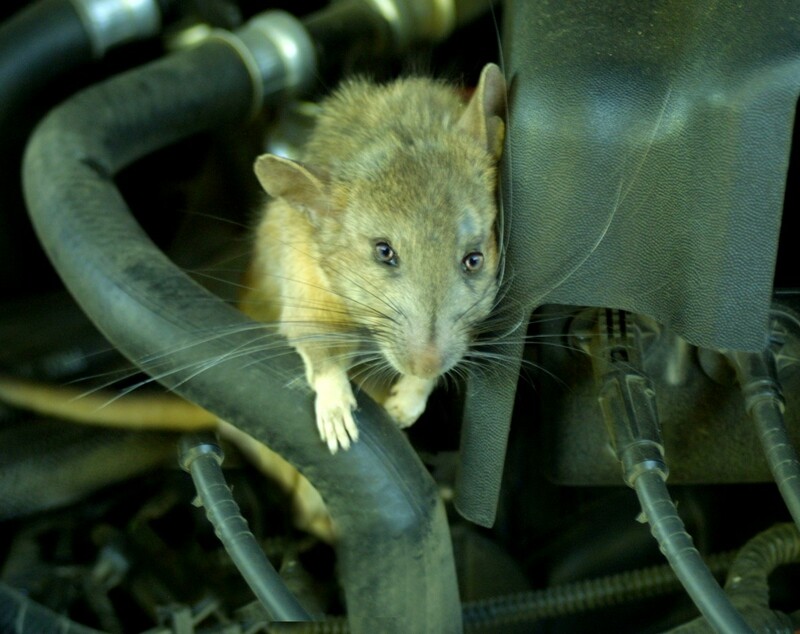 Your best bet is to get under the car and reach up to the filter from below—more room to maneuver safely. View of the oil filter from the underside. Notice how much more room there is too work with. 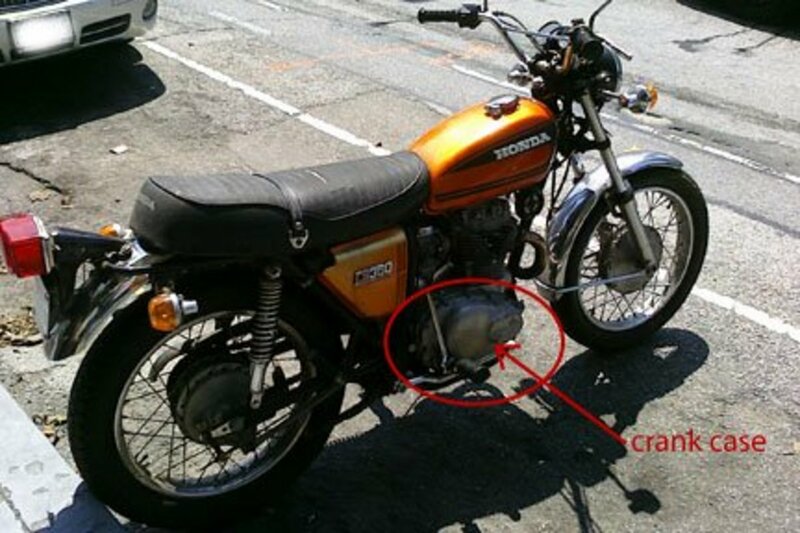 You'll want to loosen the oil filter with your wrench or pliers and then position the drain bucket beneath it. Loosen until oil starts pouring out of it. Then leave it to drain for a bit. Once it has drained enough, take it off completely. Try not to drop it into the bucket, there'll be a big splash. Hold it by the base, with the hole pointed upwards so it doesn't pour everywhere. Dump the oil out of it into the drain bucket and set it aside carefully. After you are done, put the old filter, hole pointing up, into the box that the new filter came in. This is the stud the oil filter screws on to. Make sure that the rubber gasket from the old oil filter is not stuck to the metal sealing surface. If it is, simply scrape it off before putting on the new one. Be sure to wipe any dirt or debris off of the sealing surface. New filter and new gasket. To ensure that the rubber doesn't crack and that there is a good seal, cover the gasket in oil. Apply a coat of fresh oil to the gasket before installing it. This will create a better seal and also ensure that you will be able to loosen it easier next time. 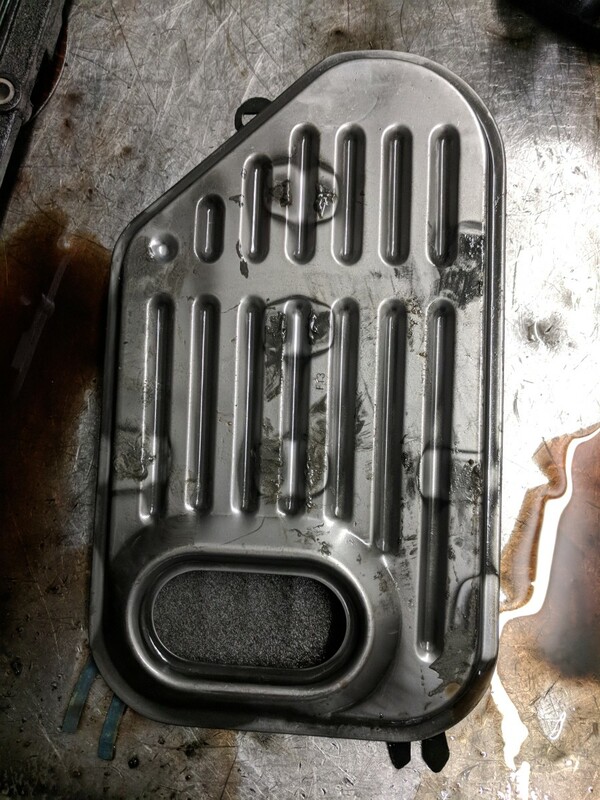 When you are installing the new filter, tighten it until the gasket seats against the engine block (first sign of resistance). Do not over-tighten it! About 3/4 of a rotation after the gasket makes contact will be sufficient. Tighten it by hand, unless you can't get a good grip, then it is okay to give it a little twist with your pliers or wrench. 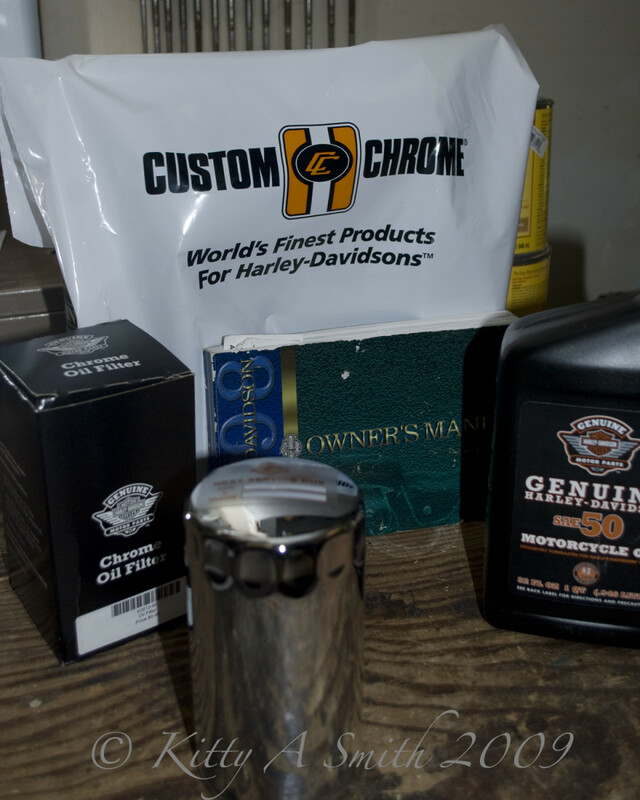 Priming the filter with oil prevents a dry start when you first crank the engine on. When you first start a car after changing the oil, there is a brief moment when some parts of the engine are not properly lubricated—before the fresh oil can circulate. To lessen this effect, fill the filter with oil before installing it. This is called priming the filter, and it is a guaranteed way to make a big mess, haha. A lot of the oil will just pour back out while you are installing it. Fill it about halfway and then make sure that you quickly get the threads started. This is not necessary—most people don't bother with it. I would only recommend doing this if you really baby your car and don't mind making a bit of a mess. It is not a vital part of the procedure—just a little extra step if you really love your engine like I do. Plastic washer on the drain plug. You'll generally see rubber washers; Toyota happens to use plastic ones. The drain plug will have a rubber washer on it to provide a good seal. Toyota generally uses plastic ones which can be reused until they get too squished and fall apart. You can get replacements from the Toyota dealership, online, or at a parts store. I have been using Nissan gaskets for this car. They fit, but they get crushed and should be replaced every time, if possible. Oil drain plug; clean and ready to be installed. You may have trouble getting the old washer off. You'll have to be violent with it, using a screwdriver or pliers. Above is a picture of a new Nissan washer on the plug, not the one specified by Toyota—but no matter. Pay no attention to my goofy, grinning mug in the background, haha. Let the oil drain thoroughly. This can be difficult if you have just the front of the car lifted up—the engine will be tilted in a way that will make it harder to drain the very last bit of oil, but this is not a major issue. Before putting the plug back in, make sure that there is no dirt or contamination on the plug. This will go straight into the new oil! 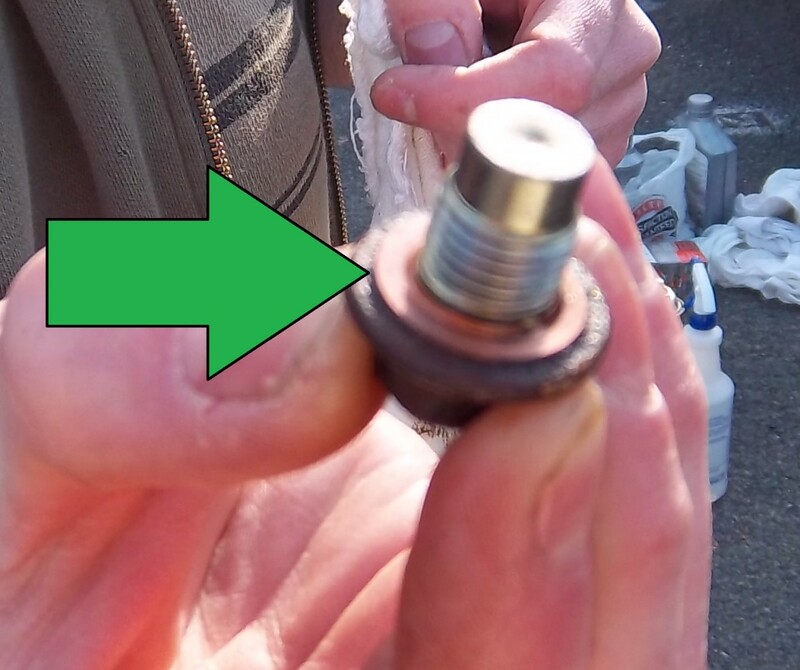 Tighten the plug until the gasket/washer is tight against the pan, but don't tighten it too much. Just use a moderate amount of force, depending on the leverage and tool and amount of muscle you have to work with. 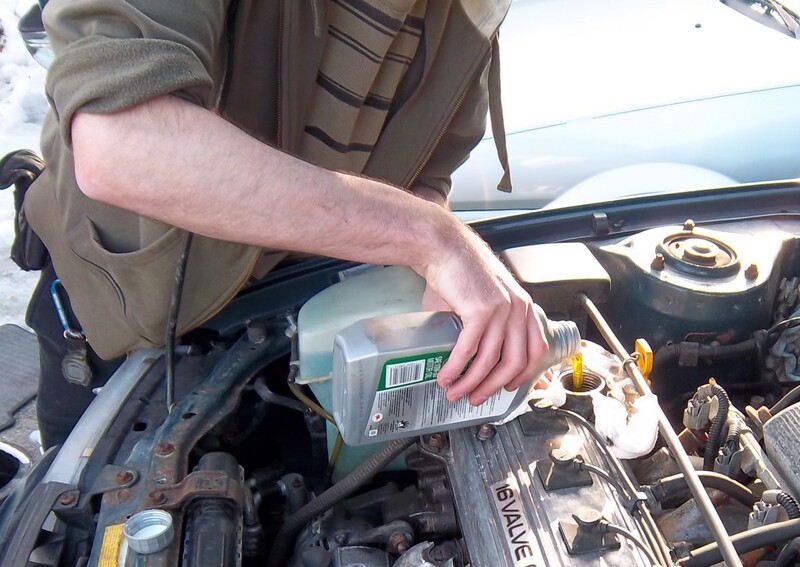 Before putting oil in the engine, make sure that you have fully tightened the drain plug and oil filter. Don't forget to reattach the plastic cover. However, you may want to hold off until the last minute so that you can confirm there are no oil leaks from the plug or filter. 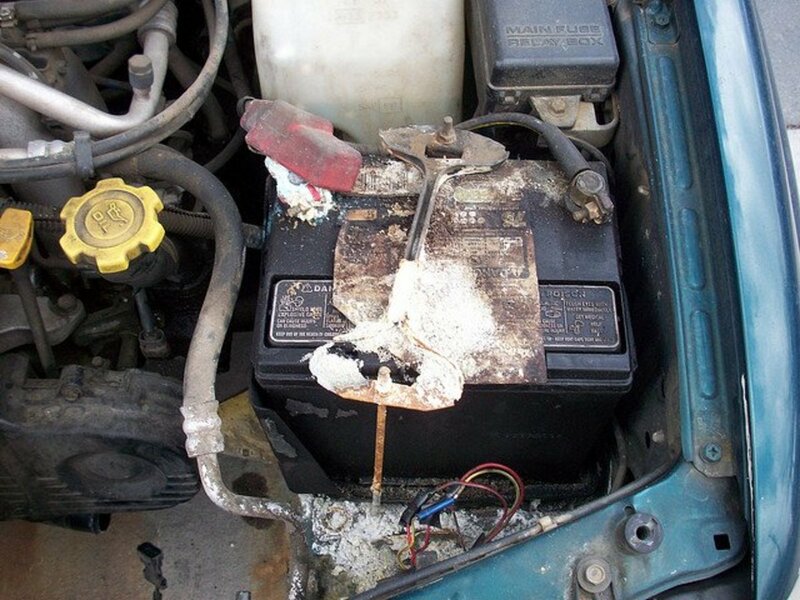 Be sure to wipe away all old oil from around these areas so that you'll be able to see if there is a leak. You can pour straight in or use a funnel to avoid any mess. Use a funnel to pour the oil. If you don't have one, you should be sure to pile rags around the hole. This will catch and absorb any oil that doesn't make it in. Every time you do an oil change on a car for the first time it's a good idea to add one quart less than you think it will take and then check the oil level. This will save you the trouble of having to drain excess oil if you overfill the engine. This is only necessary if you are unsure of the engine's oil capacity. Once you have the oil in, make sure you put the oil filler cap back on. Oil will splatter everywhere if you start the car with it off. Use a rag to wipe the oil off. Place the dipstick all the way back in. 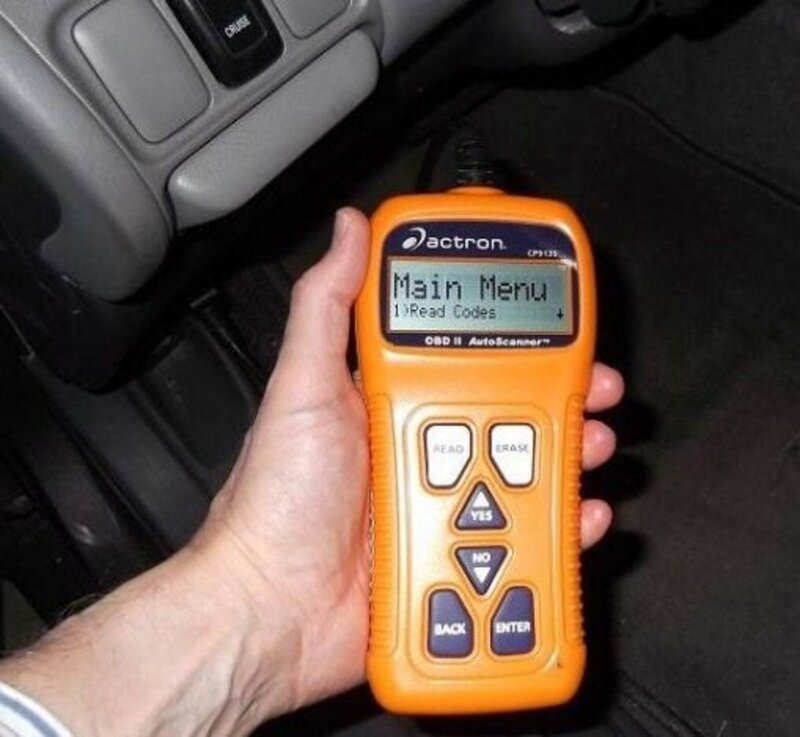 Then pull out again to get an accurate reading. Before you check your oil level, you will need to start the engine and let it run for a few moments. You can check for leaks during this time. This allows the oil to fully circulate heat up, giving you a more accurate reading on the dipstick. Be sure the car is as level as possible when checking the oil level. This means taking it off of the ramps or jacks. Don't forget to reattach the lower plastic cover if you haven't already. 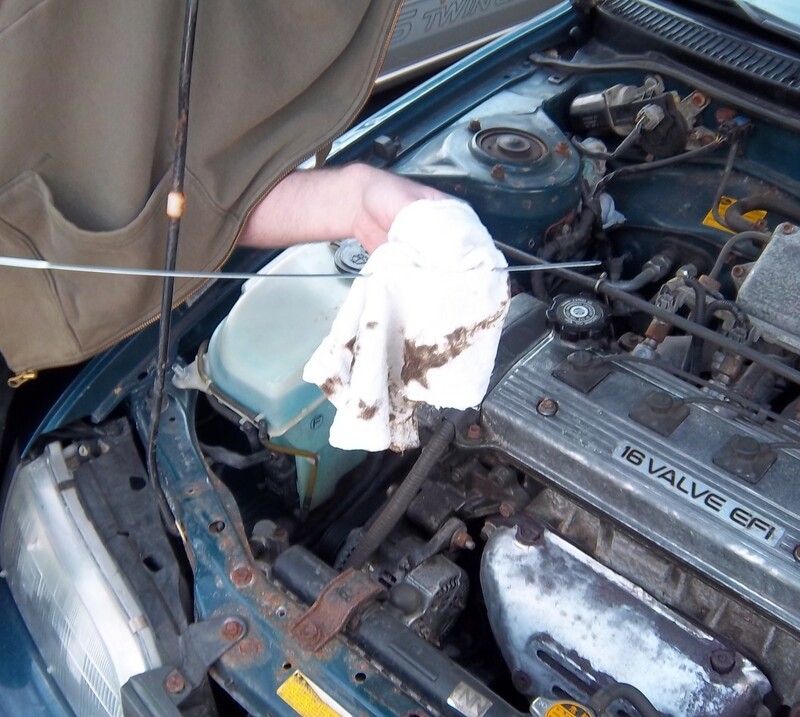 With the engine off, remove the engine oil dipstick and wipe it clean with a rag. Place it all the way back down its tube and leave it there for a second. 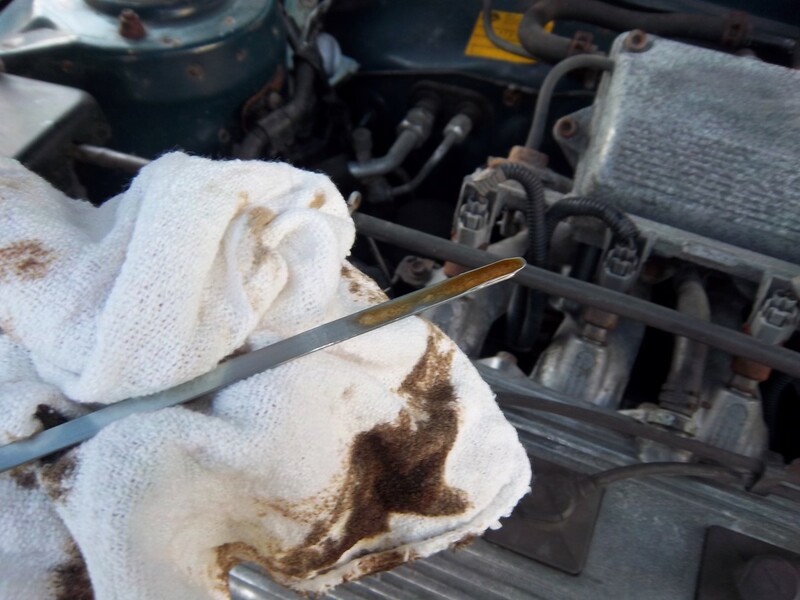 Carefully remove the dipstick again and hold it level while reading the oil level. Close-up of the dipstick. There should be two lines near the tip indicating 'full' and 'low'. As long as the level is between the lines, you're in good shape! The level is usually hard to read on one side of the stick but fairly clear and precise on the other. In this picture, the clear line was on the side without the level marks. Nevertheless, the oil level should be between the F and L marks. Ideally, you will want it to be a tiny bit below the F right after the oil change if the oil hasn't been fully heated up yet. When the engine gets really hot the oil level will go up a bit due to thermal expansion. If you have a hard time telling where the level is, feel free to wipe the oil off, put the stick back down the tube, and recheck it. Repeat this as many times as it takes to get a good reading. If the oil level is significantly below the F, you should add a half quart of oil and check it again. The distance between the F and L marks is usually about 1 quart. If the oil level is at all above the F mark when the oil isn't hot you'll want to carefully drain some oil. Too much oil can hurt an engine just as much as too little. Do this by loosening the drain plug, pulling it out by hand, and screwing it back in after a small amount of oil has come out. Well, there is the procedure for changing the oil in a 1994 Toyota Corolla. I think you'll have a hard time finding more thorough instructions on how to change oil, haha. I hope you find it useful—and not too boring. One final note: If you are inexperienced with cars, and have never changed oil before, it is a good idea to have someone else around who can instruct you—friend or family member who has some experience, for example. You may be embarrassed to ask for help with such a basic task, but believe me, you do not want to mess up an oil change. It can do major damage to the engine. It is a fairly straightforward job, but it can't hurt to have someone around to help if you run into any problems. Thank you very much for reading this article. Please leave comments and feedback—even negative comments. I'd like to know if there is anything I could be doing better. I just came across this site, its well written tutorial. I loved the step by step illustrations. Many Thanks!! It was very informative. I loved the step by step illustrations. Now I'm changing my oil like a pro. Thanks!! Thanks! I'm really happy to hear that. I hope you do change your own oil some time, it can be pretty fun and satisfying once you get comfortable doing it. Like I said at the end of the guide, it's a good idea to have someone there with more experience so they can help if you run into any trouble, or at least have someone you can call on the phone if you have any questions or problems. Good luck and thanks for the feedback! Thanks for this well-written tutorial! One of my goals in life has always been to change the oil in my car (I'm a woman, lol). You wrote something so detailed that I might actually get the guts to do it!!! Great instructions and visual aids. Well written. Thanks! Hey, John Kelly! Thank you very much for the feedback! I usually try to edit/update my hubs from time to time, and this kind of suggestion from my readers is extremely helpful. It is greatly appreciated! Thank you very much! I appreciate the feedback. I'm really glad you enjoyed it! Thanks for your assistance it surely help me in doing some mechanical work. Great pictures and step by step. I can't count how many of the inside arm burns I had from those oil filters back in the day! Voted Up@!